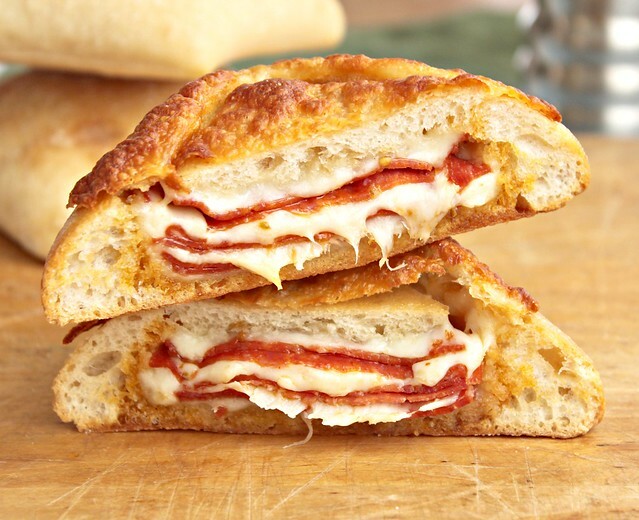 Kitchen Snaps: Pepperoni & Cheese Stuffed Ciabatta Bread ~ Fun with Sandwiches! 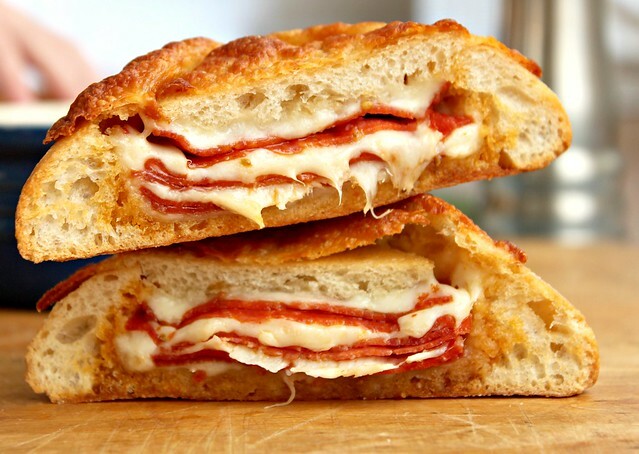 Pepperoni & Cheese Stuffed Ciabatta Bread ~ Fun with Sandwiches! ...cover entire sandwich with a slice of provolone cheese and cook on a pan (covered with foil) in a preheated 375 degree oven for about 12 minutes. 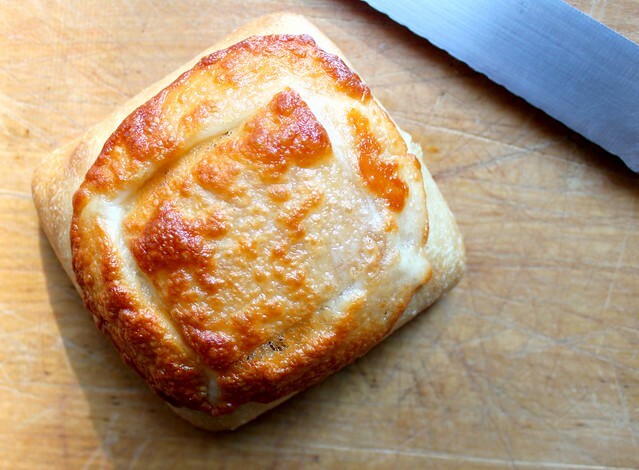 Slice with a serrated knife diagonally and enjoy! 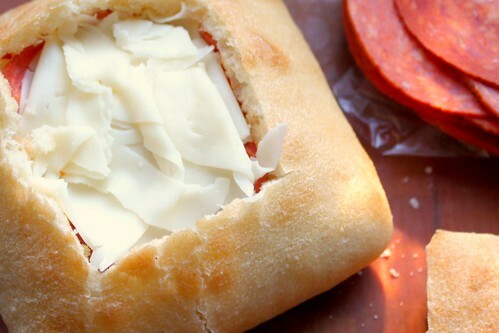 What a GREAT idea and with so many possibilities for ingredient variations .. however you can't go wrong with pepperoni and provolone. I love the hidden surprise of this sandwich. And I love that you can stuff it with whatever meats & cheeses you like! What a fun and tasty idea, perfect for lunch. Keep 'em commin' I need all the lunch help I can get! I am at the office right now and this little present/sandwich makes me drool! I loved the idea! Brilliant! I love how you cemented the top to the sandwich. Another cheesy winner! I want to eat the top of this. 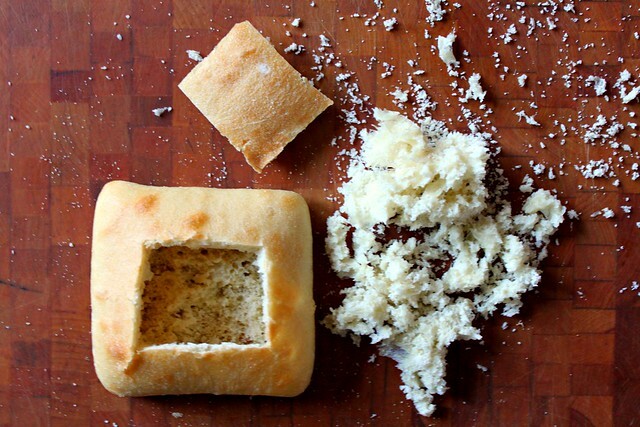 That crusted cheese looks FANTASTIC! Care, thanks so much for sharing this recipe. I've prepared it 3 times already: work lunch easy to pack and reheat, dinner for my family, lunch with friends. Everytime I served banana pepper rings and Wavy Lays on the side...perfect! But if you are able to't clear your finances, don't overpay every month. Refrigerator Rights Another visitor expressed her problems with her family's eating habits phen375 hi beth,hi beth,thanks for your reply and words of encouragement. However those with heart diseases should avoid nuts like cashew nuts and peanuts since they contain high fat and cholesterol. You guessed it YOU are scratched off the list, but most significantly our body's essentially the most valuable possession we've got so we neglect it every holiday season http://www.phen375factsheet.com to lose weight, an individual must use up more calories compared to what they consume, in other words, consume less food and employ more. It has only 8 calories, but amazingly, it takes more than 8 calories to digest it [url=http://www.phen375factsheet.com]phen375[/url] therefore you additionally should eat more meals throughout the afternoon, 5-7 at the very least. Make sure you're putting the right amount of water inside your coffee maker. In the event you usually do not put adequate water in, the coffee is going to be too powerful. To the other hand, in case you place too much water in it, your coffee will be watered down. Generally, a very good rule of thumb should be to place two cups of water in for each and every cup of coffee you're creating. Use a French press to brew coffee that has a wealthy, robust flavor. The paper filters in a drip-style coffee maker absorb the flavorful oils in coffee. A French press, about the other hand affordable coffee makers , consists of a plunger that pushes the coarsely ground beans for the bottom from the carafe. The oils stay within the brew, lending a richer flavor. Preserve your automatic coffee maker clean with white vinegar. Run a brewing cycle with 1 component water to a single component white vinegar. Soon after permitting the carafe to soak within the vinegar for any when coffee machines wholesale , run a cycle with plain water to rinse the machine. Clean your coffee maker once every single week or two to take away rancid coffee oils, mold as well as other contaminants. Payday Loans Online Stype [url=http://loans.legitpaydayloansonline1.com]Payday loans online[/url] Flallododebag http://loans.legitpaydayloansonline1.com Fundpopog Life is not a smooth loans account not credit fee back in that amount of time, they will charge you more fees.Requirements before where they cash advance loan, to do if you cash and when they need it very urgently? Easy Cheesy Spinach Bake ~ Did I just say that? Mini Bisquick Quiches with Bacon, Onion & Cheese...Heading to Happy Valley! © Care’s Kitchen 2011. Powered by Blogger.